The new functionality now exports all the contacts. Is there a way to just sync a subset? And if not, is it possible to sync tags down to gmail to allow easy copying over to My Contacts (since only those are syncing down to my iphone)? Same problem here, after enabling the new contact sync my "insightly-contacts" group is not being downloaded on my iPhone/Mac. It only'd work if I go to google apps and add each contact to the group "my contacts". But this must be done manually for each contact, so it's not the way to go. At this time all the contacts are synced. I don't believe you can sync tags down to gmail so please contact our support team here -- http://help.insightly.com/submit-ticket/ -- and they can give you a definitive answer. This is our problem too. Our company doesn't *want* all our Insightly contacts synced to Google! Something we loved about Insightly is that each user could pick and choose which contacts to Sync. Like Diederik said: Please make a subset per USER. Which they already had before they suddenly stopped it. My contacts aren't syncing in either direction aside from the initial run. That is, after running an initial sync, contacts show up in Google Apps. 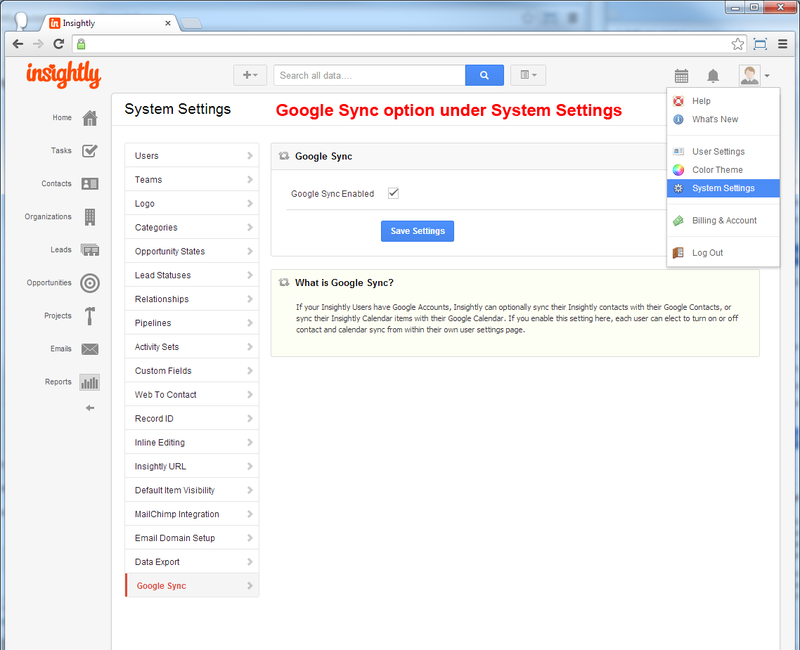 However, any subsequent changes in Insightly don't get written to Google Apps. Any changes in Google Apps don't get written to Insightly. Got same problem. It looks like any improvement Insightly makes, just makes it worse. 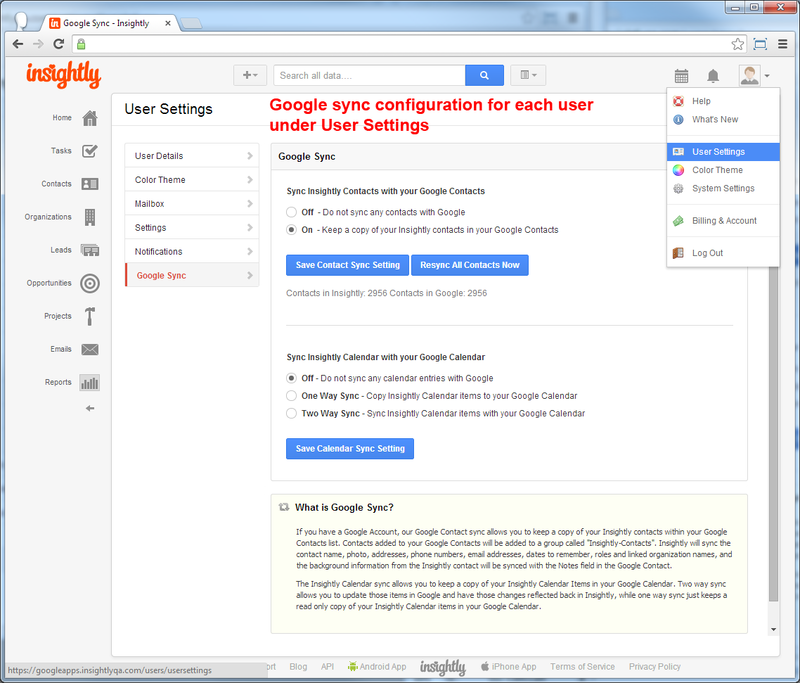 point in time, no new contacts added to Insightly can be synced into any of our domain's Google accounts. I sent a message to support. I need to get this problem fixed ASAP. I would prefer if you make the fix on the back end, so I do not have to re-sync all 8 accounts. This sync process is awful apart from the fact it doesn't work it also removes my "Insightly-Contacts" from "My Contacts" making them invisible to my smart phone. It also doubles up the contacts every time I sync! The Google App integration was one of the reasons why I chose Insightly, but I'm not quite so sure now. If this bug is not fixed soon they will start to loose users. Totally agree with what the others here said. My client is furious since the update to syncing has been rolled out. - the synced insightly contacts don't get added to "My Contacts", thus the iPhone cannot sync them. I need to add all contacts manually in Google Contacts to "My contacts" and then re-do that for every new contact from Insightly. Bad customer experience! Will you fix that? - we realised that duplicates occured, but cannot understand why. Any clues? - just to be sure, there is only one-way sync from insightly to Google contacts? no 2-way sync anymore? - rolling out the change with only an email notification and no hint inside Insightly itself is not sufficient, when you set the default syncing option for each user to "off"
Please ASAP try to fix the issues, because my client is inclined to switch the CRM tool now. Essentially not only is there no Real time Sync or 2-way Sync... there is no "Sync" whatsoever because we are just importing contacts every time. This is a shame, became Google Contacts alone lacks the flexibility and organization that Insightly offers. Hopefully this matter is taken under advisement by the Insightly team and is resolved in a timely manner. Insightly seem to have a big problem with this. Also they do not appear on your mobile as when you sync Insightly remove the from "My Contacts"! I've found a workaround until this mess gets fixed. I managed to do a Google Script kinda solving the proble. It took me one complete day because I didn’t know about this language before, but after fighting a little bit with google scripts 6min maximum execution time I got it to work with a few lines of code. My script picks all the contacts in insightly group and adds them to the My-contacts group. It makes it automatically every hour. I tried more complex and elegant solutions but they were exceeding google’s limits for executing scripts. So the project will have only one file. You can press the play icon and the script will run, you can open gmail contacts in another browser and see how the contacts get updated in real time. 3-Set the trigger (clock icon) to execute this function every hour (you can try less, but maybe Google will block your if there are too many executions per day). You can also select to receive notifications on script execution failure. It depend on the number of contacts you have. You will have to adjust it if you receive failure notifications. 4-Go to google drive, share this google script project with the rest of users you want to have old-style Insightly sync. About the permissions, I think you must allow them to edit the file in order to execute it, but you can try to set only view permissions and see what happens. 5-Configure the same trigger for them. I've been using this for a week and it's set and forget. I hope you guys find it useful. Thanks so much for sharing that, Marc! Unfortunately, I'm not as technically inclined as you -- and I completely resent it that we have to engineer a home-grown solution because they decided to suddenly discontinue a service that we were all paying for (and still do). Still, it's great that you shared it. I hope that some others here can find it useful. Thanks for sharing! Marc, thanks this works quite well, but seems to drop or crash at various stages - usually time outs. Have you experienced that. We have about 5,500 contacts. I only have to hanlde 2.100 contacts and sometimes I still get crashes every now and then too, it's normal. This script should be done in batches to avoid google execution time problems, but it was more difficult and I didn't have more time to spend on this. As I said, this was a workaround until the contacts mess is fixed. What I cannot fix is the fact that contacts are syncing forever inside insightly and the newest contacts are the ones that take more time to sync or never are synced. I don't understand why Insightly is not publicly apologising and say something like "we are fixing it to have the old behaviour as an option". As many people have said here in this post...contacts are crucial in a company, you cannot play with this because clients of your CRM will get frustrated. Every time I see a post from Insightly twitter account I think they are going to say something about the problem but no, it's just their normal Marketing/News stuff. Hi Marc, thanks for the swift response. It is unbelievable that they have done this. We, like many on this blog, selected Insightly because of its sychronisation capability with Google Contacts. I will just have to persevere, but I will be actively looking at alternatives. Have had open support ticket since 6th September and still no resolution to the Gmail contact sync issue. Has Insightly said anything anywhere about what they're doing about this or where they're going with it? Is this the way it's going to be? Are they thinking about going back to the old system? Are they moving toward the sync-by-category option that Apptivo has ( http://www.apptivo.com/contacts-sharing-new/advanced-setup/category-sync )? With a minor annoyance : it was slow to sync sometimes. Now you've killed the "raison d'être" of the sync, its core features to fix the speed issue, and sorry, but yes we prefer to use the native iOS contact app than your iOS app to change/update some contact info. Such product decision is eroding the confidence we have in you. Show us you are a great company, and fix it ASAP, and restore this trust. This is totally unacceptable. You have managed to screw up my company contacts royally. My contacts have been "syncing in progress" for a week. And then having to run the script is a step too far. Either fix it or reverse this update and re-instate when it works properly. One week until I start looking for another system. But the initial problem with not adding contacts to My Contacts persists. Damn you Insightly. Since Insightly changed Google Contact sync, I've noticed some of my Insightly Contacts are missing from Google Contacts. I don't even care anymore because I plan to get rid of this virus of a company fairly soon. Insightly is the most self absorbed company I have ever done business with. They care not about the Customer's needs. If they did, they would ask for our feedback and be open and honest when they make a mistake; instead, when a problem arises they pretend like there is no problem at all, then obfuscate or redirect the support request, making it seem like YOU are the problem, or YOU are insane. We are currently looking around for alternatives and hope to make a switch soon. WorkEtc. seems like a much better alternative. Pricier -- but you get what you pay for. Daniel Barnett, the CEO, does all that he can to please the customer. Anthony, take notice. Your product is another casualty of Management by Objectives. Pay the investors back and take control!